The original serenity prayer is stated as follows: “God, give us the grace to accept with serenity the things that cannot be changed, courage to change the things which should be changed, and the wisdom to distinguish the one from the other.” This serenity prayer was written by Reinhold Niebuhr. Over time, Alcoholics Anonymous adopted the prayer as part of the Twelve Step program. 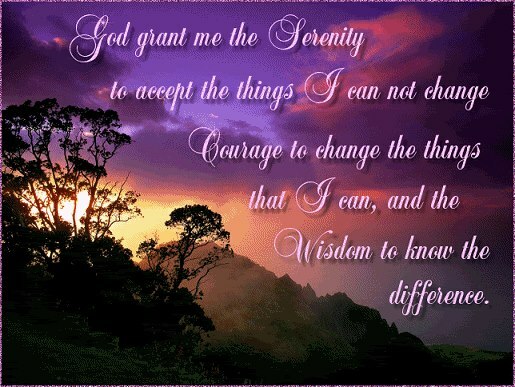 The prayer was modified and is said as: “God grant us the serenity to accept the things we cannot change, courage to change the things we can, and wisdom to know the difference.” While the serenity prayer’s origin may be sketchy, the prayer has been used extensively in Alcoholics Anonymous (AA) since 1942. One of AA”s founders, Bill W., says the prayer was introduced to the program by Jack, an AA member in New York. According to “A.A. Comes of Age,” Bill W. writes how Jack found the prayer in A New York Tribune obituary. Soon after, the prayer was printed on small cards and carried everywhere by AA members. The rest is history: the serenity prayer is known worldwide as a prayer of strength and hope for AA and Al-Anon, and other myriad Twelve step members. I know it has helped me many a time, to the point where I’m praying it without even being aware of it at first. 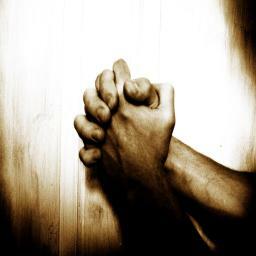 Prayer is important to me, but I don’t do it as much as I should. I pray for people who need prayer, and I pray prayers of thanksgiving when prayers are answered, but I don’t just meditate on God’s goodness, or spend time with Him. That’s uncomfortable for me. It’s something I need to work on. The two most crucial “formal” prayers for me, are the Serenity prayer and the Our Father. Yesterday I mentioned the importance of the Serenity prayer in my life, and how often I pray it. I use it for simple things, like trying to accept the fact that my Kindle hangs up when I underlines something and doesn’t go back to the page directly, so I have to wait until it “unfreezes” and goes on to the next page. There I sit, with my Kindle, praying that first line, and it all starts with God. God, grant me the serenity to accept the things I cannot change… because I know I can’t change Amazon’s Kindle. It’s the second Kindle I’ve owned, the first being the one I sent back because of the same problem. So I know it’s something I have to just accept. But I pray for serenity, because it’s not an easy thing. I use it with more difficult things, as I try to accept that the alcoholic in my life might have brain damage as she recovers from this last bout of drinking. She’s going to be 63 years old, has been drinking more on than off, since the age of 16, and life is catching up. Her body is tired. I pray, on my knees, sometimes just the first three words. Because this is harder. God, grant me. Wisdom, I’ve heard tell from around the tables, comes at the expense of falling flat on your face and learning otherwise. LOL Yes, wisdom comes from making mistakes. That’s how we learn the difference between knowing the things we have to accept and the things we can change. It’s experience, an old teacher. 😉 Yes, I’ve had some wisdom. And I’m sure I’ll get more along the way.